TEL AVIV, ISRAEL — My last day in Israel was spent with my friend Yoav Avni exploring some sites in the central part of the country before my flight left Tel Aviv late in the evening. 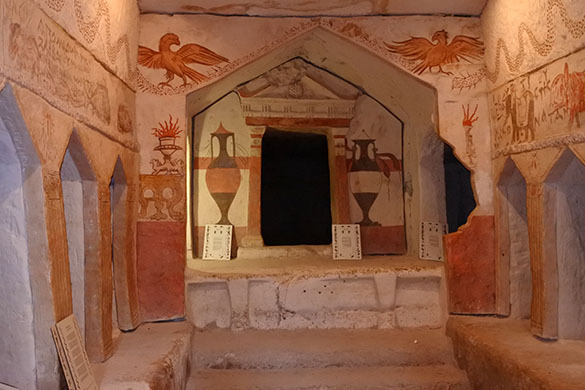 The most geological place we visited was Maresha (which later became, in order, Beit Guvrin, Eleutheropolis, Bethgibelin, Bayt Jibrin, Kibbutz Beit Guvrin and Beit Guvrin National Park — you know there’s a long story there!). Maresha was an 8th Century BCE Israelite city in Judah that guarded several trade routes and access to the Judean hills from the coast. It thus had significant strategic value and was subject to just about every conqueror of the region since the Iron Age. 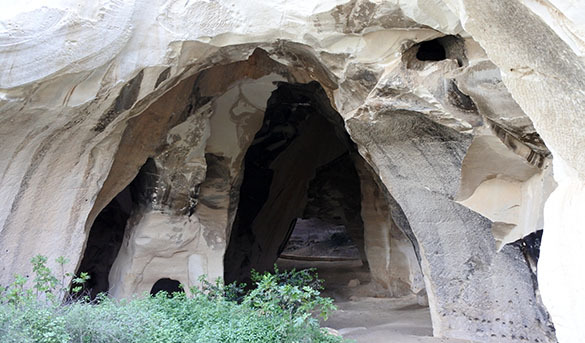 The bedrock has a very thick section of the Maresha Formation (Eocene), a homogeneous soft chalk that is easily carved. This chalk has long been quarried for building stone and the main component of plaster and cement. The typical quarries are bell-shaped, with a small circular entrance from ground level and an expanding cone downwards. Above we see several intersecting quarries exposed by a roof collapse. 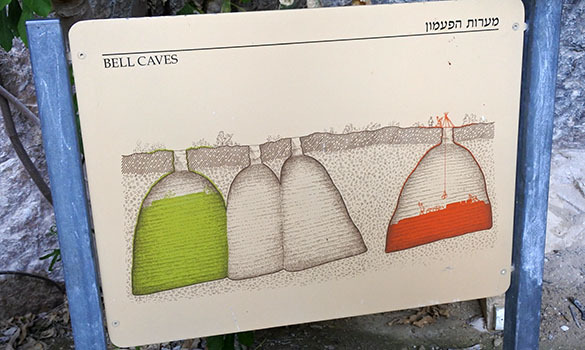 Here is a helpful diagram showing the construction of bell caves. The top geological layer is a hard calcrete (caliche) locally called nari. It provides a strong roof for the quarries. 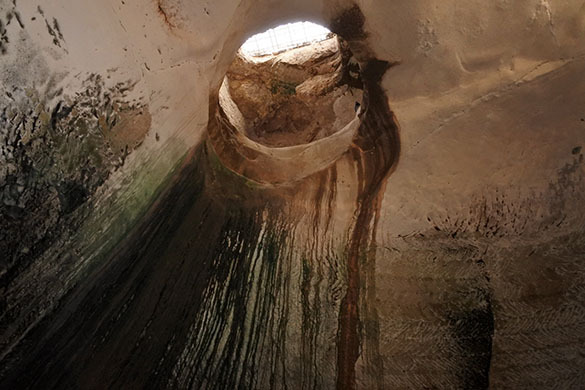 The opening of a bell cave through the calcrete upper layer. 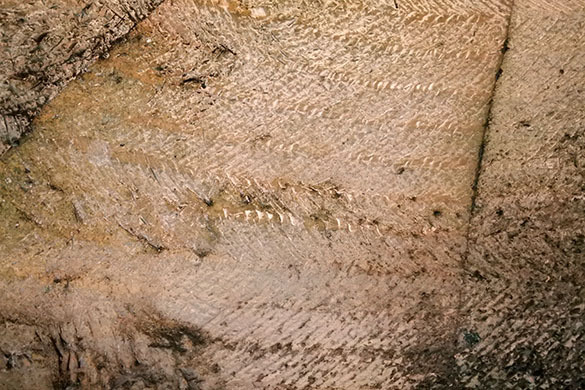 The sides of the quarries easily show the tool marks made by the workers as they spiraled down into the bedrock. This rock is soft enough to dig with your fingernails. I didn’t want to crop out Yoav’s happy face! 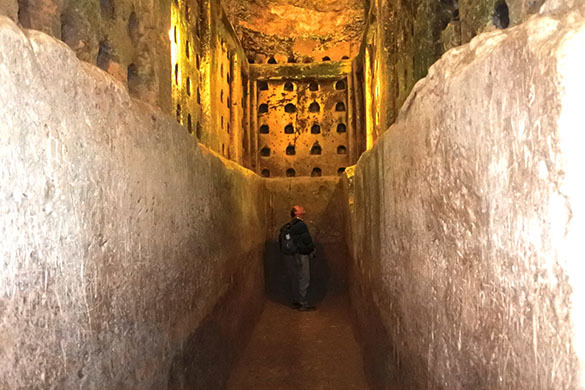 He is standing in the bottom of a bell cave repurposed as a columbarium. 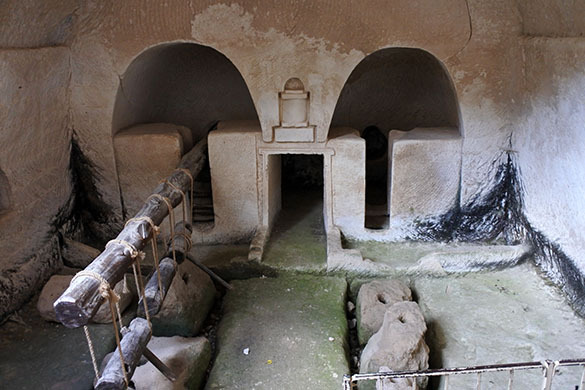 There are several underground olive oil factories that were active from the 3rd Century BCE until modern times. This device was driven by a donkey to crush raw olives. 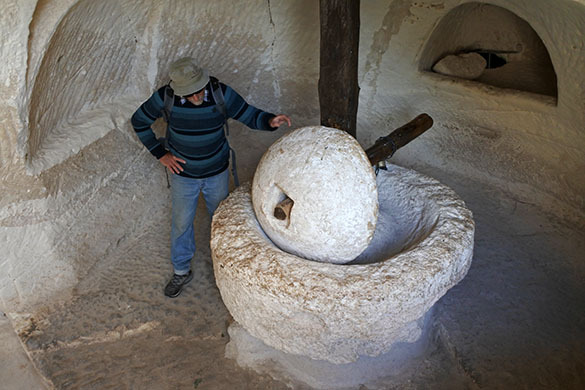 This is an underground olive press. Heavy stones were attached to the beams to press the juices out of olives cracked first by the donkey apparatus above. Nothing else remains that I can do for you, or that will pleasure you. I am sleeping with someone else, but it is you I love, dearest to me of all. In the name of Aphrodite, I am happy about one thing, that your cloak has been left to me as a pledge. But I flee, and permit you expanses of freedom. Do anything you desire. Do not strike the wall; it only makes noise. We will motion to each other; this will be the sign between us. 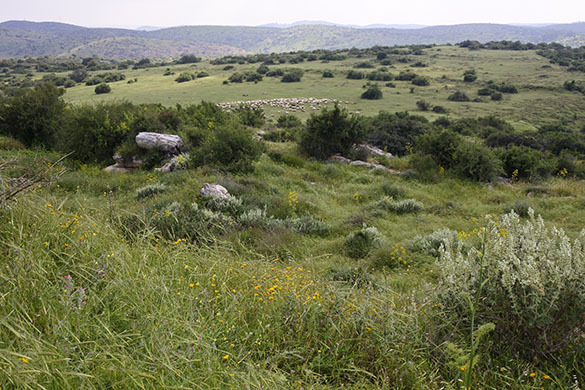 The scenery above ground at Tel Maresha is lush and green. This region received more than the usual amount of rain this season, and it shows. 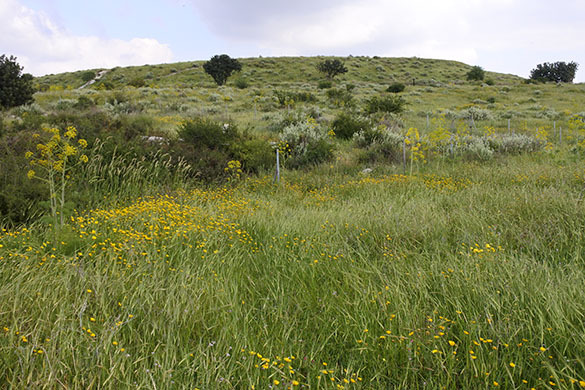 We are looking here from the tel towards Hebron in the Judean hills. Note the herd of sheep in the middle ground distance. 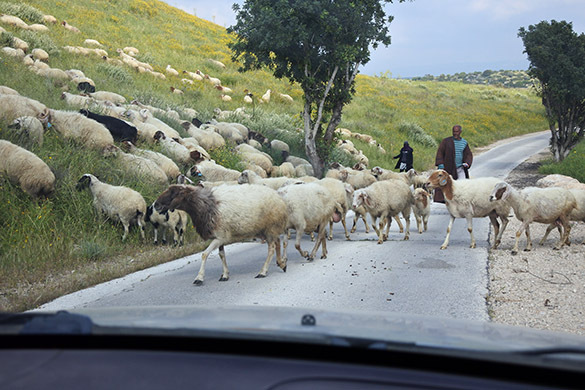 Later in the day we met those sheep and their Bedouin shepherds. And here is Tel Maresha itself. 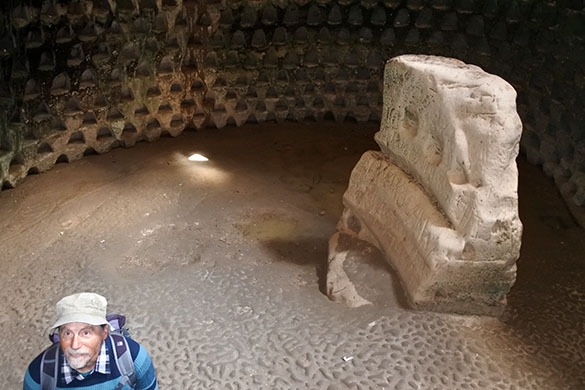 Only 10% has been excavated, so much more remains to be discovered. Mark, I never got around to thanking you for posting all the “extra-dimensionality” surrounding your trips, particularly to Israel. While the fossils are fun, I love seeing the flowers, “wildlife,” and history, too. Thanks, and I’m certain there are plenty of others out here in the ether, who enjoy all of your posts, quietly. I’m sure it can feel like a chore, at times, but they are enjoyed by many.